The 45th annual Run Seal Beach, again drew a big crowd to the old town area, as thousands of runners and even more spectators crowded the streets to enjoy the 10K and 5K events on a beautiful morning. Both fields of runners and walkers (more than 4,000) were filled with locals. Los Alamitos resident Kaleb Yamane was the top finisher in the 10K event, running the course in 34 minutes and one second. Yamane, 18, was one of the top runners for the Los Alamitos High cross-country team this year. Run Seal Beach Board officials said that the run required more than 500 volunteers, from the race crew, to public works employees, volunteers from local organizations and police, lifeguard and other safety personnel. The race also required the monetary support of area sponsors. “This beloved community run would not be possible without our generous sponsors,” Run Seal Beach President Greg Phillips said. A couple of Long Beach residents were among the top 10. Dean Yacoubian, 19, and Alan Grant, 46, finished third and sixth, respectively. Yacoubian finished in 36:14 and Grant clocked in at 36:59. Robin Yan, 41, of Rossmoor took ninth overall with a time of 38:51. Jessica Rinehart, 33, of Long Beach was the top female finisher, taking 10th overall, with a time of 39:02. Young Park, 53, of Seal Beach was 11th overall with a time of 39:05 and was second in the male, 50-54, division. Richard Graves, 53, of Long Beach was 12th overall, with a time of 39:18 and Lorenzo Tyner, 54, of Seal Beach took 14th overall in 39:48. Nathan Searles, 42, of Rossmoor was 18th overall with a time of 40:49, and Michael Sandoval, 15, of Los Alamitos was 19th overall with a time of 41:01. Kathleen Phair, 59, of Seal Beach was the second female finisher with a time of 43:23 and was first in the female age 55-59 division. Callie Pfaff, 27, of Los Alamitos was the third female finisher in 44:45 and won the female 25-29 division. Holly Park, 50, of Seal Beach was the fourth female finisher and also won the age 50-54 division with a time of 44:59. Three Seal Beach residents, Aidan Lee, 15, CJ Jacobs, 28, and Christopher Johnson, 47, were all among the top 52 runners. In the 5K run, Brandon Palacios, 16,of Santa Ana was the top finisher, with a time of 16 minutes, 44 seconds. Dylan Gaba, 15, of Cypress, took second with a time of 17:31. J’von Leong, 18, of Seal Beach was the sixth overall finisher with a time of 18:32 and another Seal Beach resident, Abraham Wallander, 16 was seventh in 18:34. Karla Lopez, 28, of Orange was the top female finisher at eighth overall in 18:48. Stephen Smith, 26, of Seal Beach took 17th overall with a time of 19:23, while Aaron Ibarra, 15, of Los Alamitos was 19th in 19:32. John Taylor, 46, of Seal Beach was 20th with a time of 19:54. Nolan Mead, 35, of Seal Beach took 22nd overall with a time of 19:56 and Josh Wright, 30, of Long Beach took 23rd in 19:56. Maya Villa, 12, of Seal Beach was the fourth overall female finisher with a time of 20:57. She won the age 11-12 division and was 42nd overall. 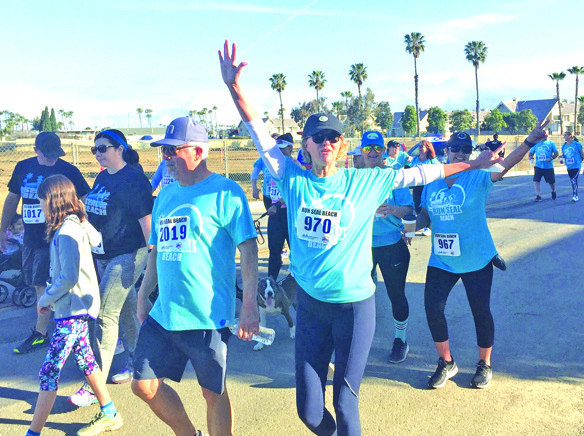 The primary goal of Run Seal Beach is raising money for organizations that are promoting recreation or fitness. The grants made possible by the run have benefitted organizations in Seal Beach, Rossmoor and Los Alamitos. Since 2003, RSB has given back more than $1,688,000 to more than 114 organizations in the community. “This race has touched thousands of residents, students, servicemen and those who are served by our community,” Phillips said.